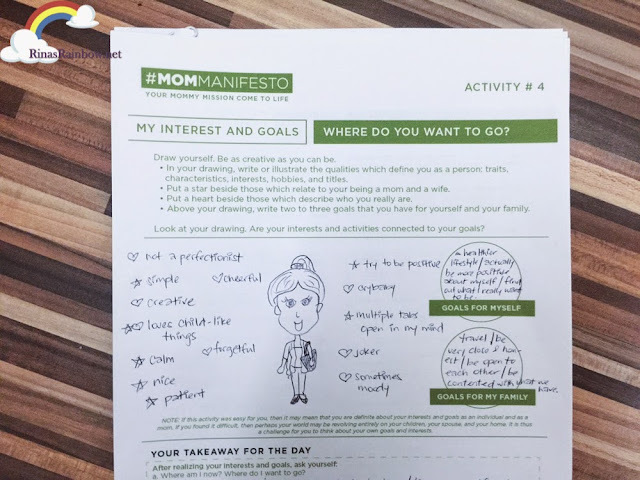 Thanks to Mommy Mundo, they came up with a 5-week Mom Manifesto online campaign where moms can do a 6-step program (one program per week for 5 weeks) with activities that moms can answer in 15 minutes or less, that can help moms really think about their goals as a mom, or reflect in some things that may have lead moms to become the type of parent that they are now. 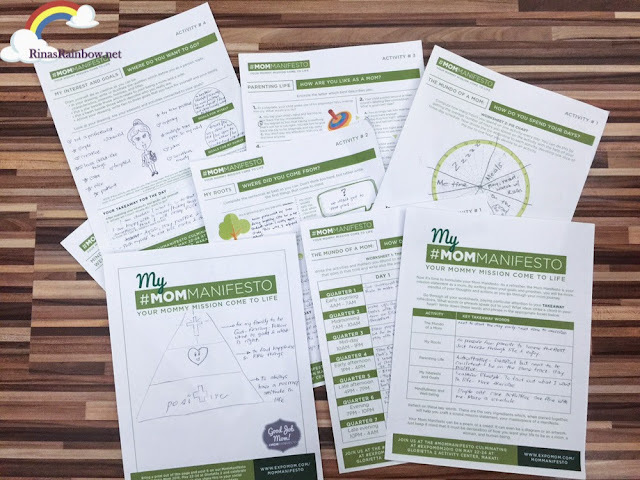 With this self-awareness activities, moms can lift key learnings and create their own #MomManifesto. Here's one of my work sheets. It's funny that for a person who tries to always be positive in a lot of things, I couldn't help but notice that a lot of my answers in my work sheets show so little confidence I have in myself as a mom, and as a woman. Side story--- Just this evening I came from my sister-in-law's house who's one of the best home cooks I have ever met. And their normal dinner is like a restaurant treat in our tummies already. It was so good! And so it made me realize how different I am from a lot of moms. I sometimes feel like everyone has this notion that all mothers MUST be excellent cooks. But no matter what I do I just don't have the interest to do so. Should I feel shameful for not striving to learn excellent recipes for my family? My husband doesn't seem to mind. Anyway it's these type of things that remind me that I'm no Bree Van De Kamp (a perfectionist homemaker in the show Desperate Housewives), and thus making me feel clueless on whether I'm on the right track or not. But of course just because I'm not part of the status quo doesn't mean I'm a bad mom. And so again, it falls on my lack of self-confidence. It's definitely something I really need to work on. 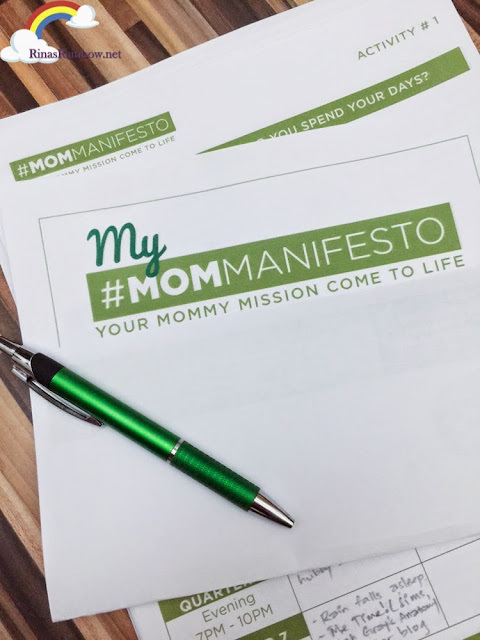 The Mom Manifesto activities made me realize what I need to work on with myself as a mom. And I'm thankful I was able to reflect on this early on while Rain is still only 3 years old. There's still more challenges and experiences ahead of us! 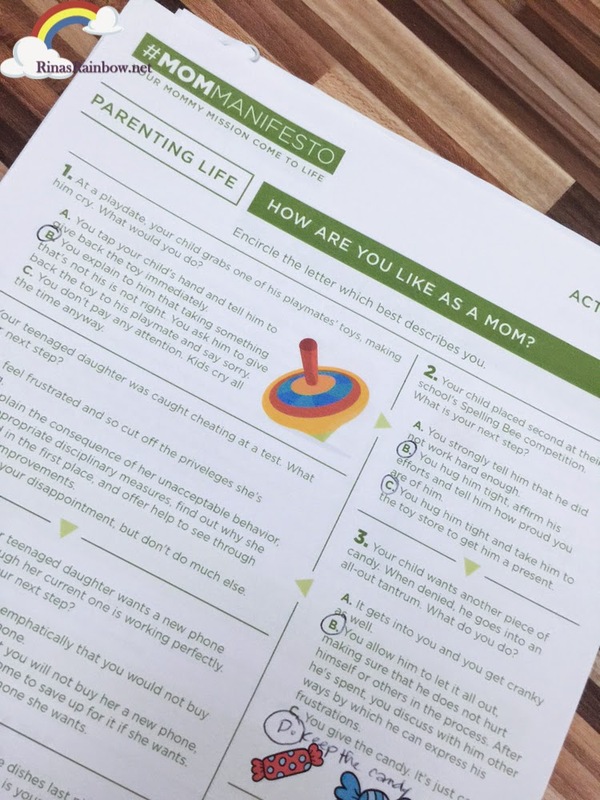 This Mom Manifesto also gave me some sneak peaks on the possible challenges I will have as a parent when my child turns into a teenager. I know I answered mostly B's in this one which means my parenting style is authoritative. So here's hoping that I will really stick to this when the time comes that I really face the sample scenarios here. So aside from all the smaller details I wrote like in the other work sheets like living a healthier life, trying to make a more effective schedule, etc,... In the end my big picture is to become a mom who raises her children to be always have a positive outlook in life (because positive attracts positive), and then to just really follow what their heart wants and find happiness even in the simplest things, and to top it all off, to be the mom that raises God-fearing children. That they follow what is right, and what is good for everyone. Thank you to Mommy Mundo founder Janice Villanueva, and life expert / certified psychologist Michele Alignay M.A. 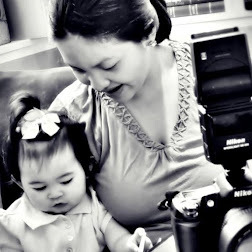 for designing this online workshop for moms. I had fun doing it! 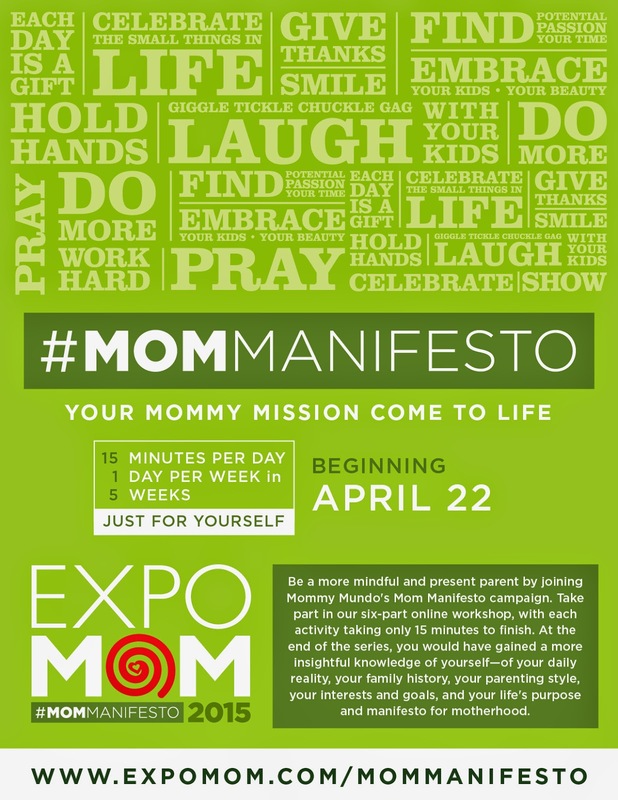 And I will definitely post my #MomManifesto statement on the wall of Expo Mom 2015 happening on May 22-24! 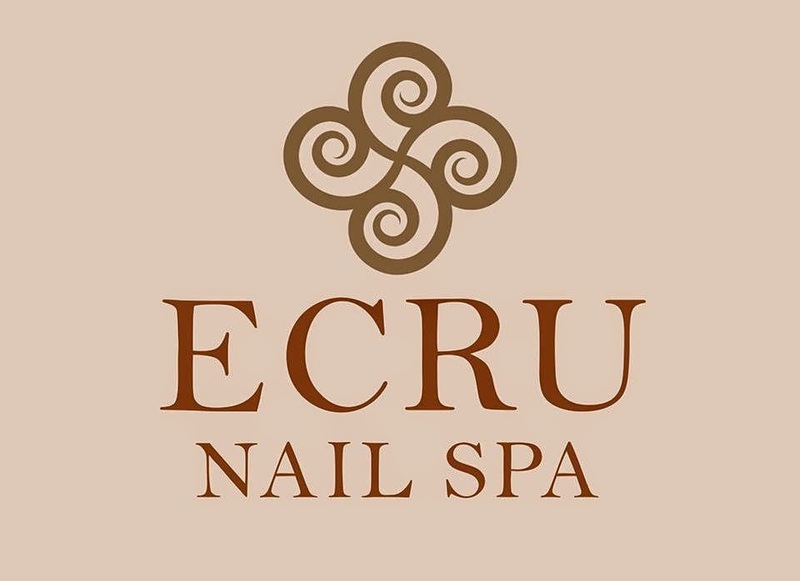 Where, by the way, lots of top mom-approved/tested products and services will be showcased. Products for moms, by moms! And of course, alongside top mom and baby brands in the country today. 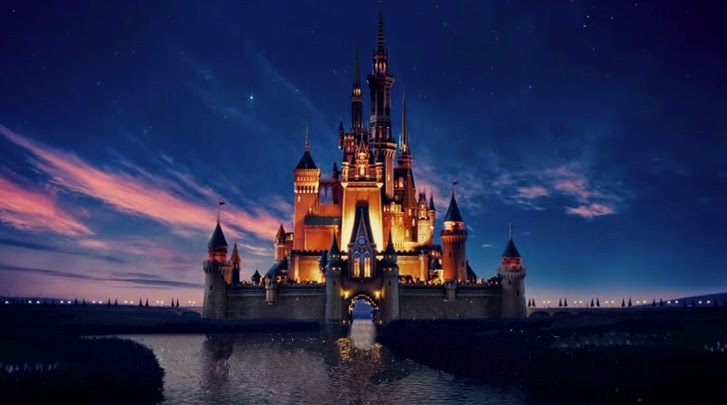 Another thing nice about it is that entrance fees, donations in cash and kind (like clothes, school supplies, books, shoes, etc) will all go to MomShare's partner beneficiary Childhope Asia Philippines, to aid in literacy and health programs for street children. If you want to do the #MomManifesto Online workshop, you can still do it! Just go to http://expomom.com/mommanifesto/ and click on the Worksheets tab. Feel free to share your take aways online too if you want! It's quite fun! Türkiye sohbet odaları sizlere en iyi sohbet ve sohbet sitesi hizmeti sunmaktadır. Bedava sohbet ve bedava chat sayfasi sizlerle. Türkiye oyun oyna sizlere en iyi mobil oyunlar ve bedava oyunlar hizmeti sunmaktadır. oyun ve oyunlar sayfasi sizlerle. Türkiye'nin en çok tercih edilen, en eski sohbetler | sohbet | güzel sözler | oyun oyna | sohbet aramaları için lider ve seviyeli bir sohbet odası arıyorsanız, kesinlikle doğru adrestesiniz.